It looks chaotic, at first. But when I look at this image, I see possibility and new life bursting out in all directions. Many blossoms have already opened, but others are still closed tightly, waiting until the moment is right to spread their petals to the sun. This is a mature tree, and this is not its first spring. It has experienced many cycles of the seasons, from flower to fruit to falling leaves and bare branches. To some eyes, that bare winter tree might seem dead. But its life is far from over, and with the warmth of spring the buds swell again. A new chapter in its story begins. 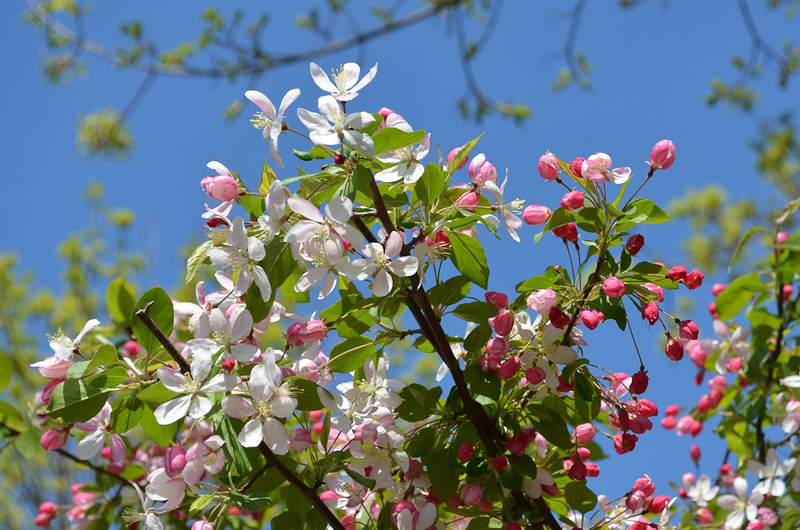 When I saw these beautiful blossoms and buds against the clear, deep blue sky, lifting their faces to the sun, I felt a connection and kinship with them. They seemed symbolic to me of my own life right now, one chapter ended and another beginning. Retirement is perceived by many to be the end of a person’s worth and usefulness, but I’m filled with excitement. What I see is the potential and purpose of all those buds on this old tree, and I can’t wait to see each one open in its turn. Linking to Kat Sloma’s Photo-Heart Connection for April. Categories: Photo-Heart Connection | Tags: flower, growth, heart connection, renewal, retirement, spring, trees | Permalink.